Assets in smart-beta strategies have reached a record $607B globally, with $539B in US strategies. Typically, smart-beta strategies are rules-based strategies that exploit an inefficiency in the market or a factor which has historically produced returns over the benchmark return. Examples of smart-beta strategies include factor ETFs such as value, momentum and quality. Other popular strategies include low-volatility and dividend-based strategies. With the rise in popularity of such strategies, it is prudent for investors to really understand the nature of the strategy that they are buying. It is important for investors to understand the economic rationale behind the strategy and its payoff structure. Factor-based strategies, while adding value, may take time to pay off, may exhibit volatility and may underperform in certain market or economic environments. As with any other investment, individuals should understand the product that they are buying so that there are no nasty surprises. Beware of data mining. There should be a clear, plausible reason that a strategy has produced excess return in the past and for investors to believe that it will continue to perform well. Data can be analyzed ad nauseum and spurious correlation can be found among many factors. For example, in a paper on data mining, Dr. David Leinweber found that the factor with the highest correlation, or ability to predict returns, in the S&P 500 was butter product in Bangladesh. He described this type of data analysis as “torturing the data until it screams.” I can think of no reason that this statistic should have worked in the past nor why it should predict market performance in the future. Therefore, it would not make sense to invest in a strategy which used this as a basis for its strategy. On the other hand, strategies based on factors such as valuation – belief that inexpensively priced assets tend to outperform more expensive assets – have sound reasons for outperforming. There are risk-based as well as behavioral based explanations. There are also sound reasons for other strategies such as quality and momentum to perform well. What is important when evaluating factor-based strategies is to understand the reason that a strategy has done well and to have confidence that it will continue to add value. How do you define the factor? Once you decide that a specific factor has investment merit, it is important to understand that there is no standard definition for that factor. For example, while value tries to identify underpriced assets, there are many definitions of value. Generally, value strategies start with price in the numerator. However, different items on a company’s financial statements can be used as a denominator. For example, price can be divided by earnings, book value, cash flow, sales, EBITDA, etc. For each metric, there is a rationale. While these various valuation factors are correlated, there may be differences in the magnitude of performance or when they pay off. For example, price to book value tends to be more closely associated with risk and tends to do better coming out of periods of extreme risk. With thinking about momentum, there are different time periods to consider – six months? 12 months? 12 months less the most recent month? There are many definitions of quality ranging from accruals to returns-based measures such as ROE or ROA. This is not to advocate any particular factor over another, but merely highlights that it is important to understand how the factors is defined. What is the payoff structure? While many factors pay off over time, they do not pay off all of the time. Factors have specific pay off patterns, may perform well in certain economic or market regimes and not others, and experience extended periods of outperformance or underperformance. Chart 1 below depicts the payoff of valuation and momentum over time. 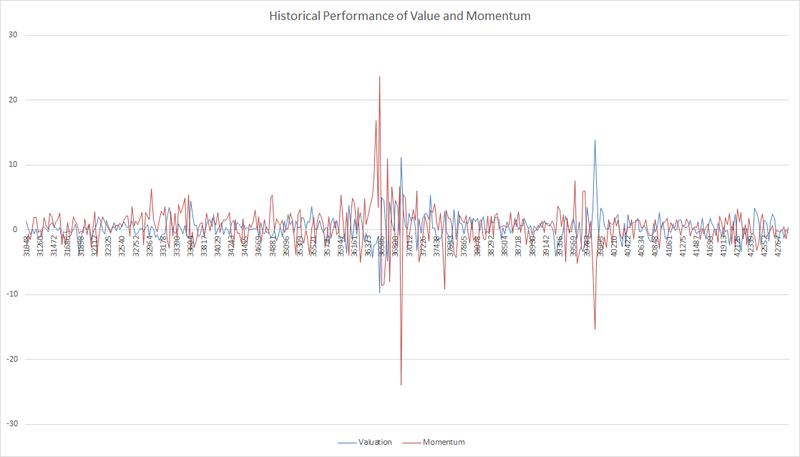 This chart clearly shows that value and momentum have very different payoff patterns. In fact, their performance tends to be negatively correlated, e.g., when one outperforms, the other underperforms. The correlation between these two factors is -.53. The takeaway is that at times, a factor will underperform and that underperformance can be significant. The underperformance may be significant and may last for an extended period of time. Chart 2 depicts the relative performance of valuation (Russell 3000 Value Index – Russell 3000 Index). From the chart, you can see that value underperformed during the tech bubble, the financial crisis and for much of this year. Another fact that stands out is that the performance of certain factors may be more volatile than that of other factors. 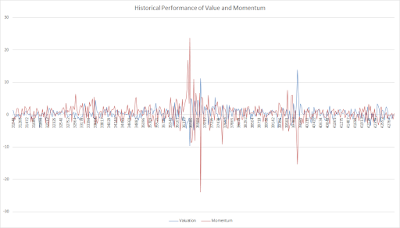 Chart 1 shows that the performance of momentum is more volatile than that of value. In fact, the standard deviation for the performance of the value factor is 3.4 while that of the momentum factor is 7.1. Again, this is not to advocate one strategy over another. Rather, it is to highlight the importance of understanding the nature of the strategy in which you are investing. One way to mitigate the risk of an individual factor strategy is to invest in a multi-factor strategy. Combining factors can help to smooth out the return stream. In conclusion, smart-beta strategies are increasingly popular investment strategies. Owing to the outperformance of popular factor strategies and the low fees associated with the ETF wrapper through which many of these strategies are available, they will continue to grow in popularity and assets. As a result, investors should understand the economic rationale of the strategy, confirm that the strategy in which they are invested is consistent with their perception of the strategy, and understand the payoff structure of the strategy. In this way, their expectation will be more reasonable and they will be less likely to be surprised or disappointed.